Retire overseas? Do your homework here...it is well worth the time. The first reaction is that it's not safe, the healthcare is no good, they don't like Americans, it's not all that cheap... None of this is true. 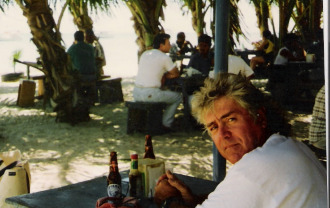 This is a picture of your's truly, eating at a beachfront restaurant on the Isle of Margarita in Venezuela. We came ashore in our dinghy, pulled the dinghy up on the beach and had a lunch for two for five dollars. That included 2 beers apiece...PS the floors at this restaurant were sand. Only two items on the menu, calamari and fish... But we knew it was fresh, because the fisherman, we saw from our "table" were constantly bringing in their catch from the sea. 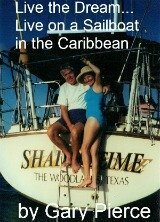 We lived overseas for the eight years we lived on our sailboat... We never had a problem, never felt uncomfortable or unsafe, found the medical care to be more than adequate... We trusted our eyesight to a Venezuelan Dr. Here is a list of misconceptions that most people in the US conjure up when they think about retiring overseas. Healthcare... It is cheap affordable and excellent. According to the World Health Organization (WHO) the healthcare in the United States ranks 37th in the world... It's number one in the expense department. Crime... Despite all the drug violence in Mexico, the crime rate in Mexico is one third what is the United States... You are many many times more likely to be murdered in Detroit or Chicago than in Mexico. Many people think that the United States and only the United States has good communication. In eight years of living overseas we found that the phones worked, computers and smart phones worked... You are always in email reach. The local markets and grocery stores were more than adequate for our needs. We also found that the pace of life is much slower overseas, family and relaxation with family is extremely important, and you will quickly adapt to this slower pace of life. The fact that we breathed fresh air 24 hours a day seven days a week didn't harm our health at all... On the rare occasions that we did need medical attention we were pleasantly surprised at the service and stunned at how little it cost. Do not let a perception of bad medical care deter you from this inexpensive and fun lifestyle...news flash... people get sick everywhere. So retire overseas, it is cheaper than retiring in the United States, and certainly beats continuing to work here versus relaxing in a foreign country.